This suggests that if one needs to group users for permission assignment and email distribution, one would need to create two different groups - a security group and an email distribution group. Clearly, there are cases (for example: when the same users need to be assigned permissions to a resource and receive email notifications about it) when it would be desirable to have a single group to be used for both. In on-premise Active Directory (AD) and Exchange one would use mail-enabled security group for this purpose, but what are the options in Office 365? Surprisingly, the answer to this question wasn't as forthcoming as I would expect it to be and finding any information on how to create an email-enabled security group in O365 proved to be challenging. Finally, I came across the following Knowledge Base article, which indicated that it could be done via directory synchronization (DirSync) tool. 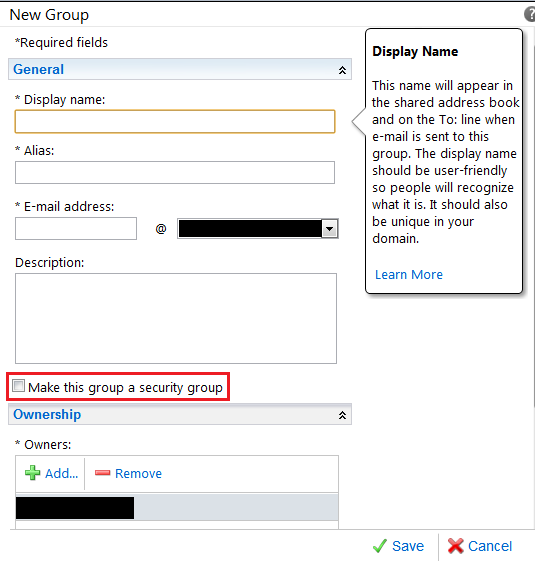 Once a group has been created, changing group's type (mail-enabling security group or making distribution group a security group as well) doesn't seem possible. However, at moment of creation distribution group can be designated as security group as well. new-distributiongroup -name "[Group's Name]" -alias "[Group's Alias]" -type "security" -primarysmtpaddress "[your_address@your_domain]"
Really informative data on MSBI, looking for best msbi online training institute ?